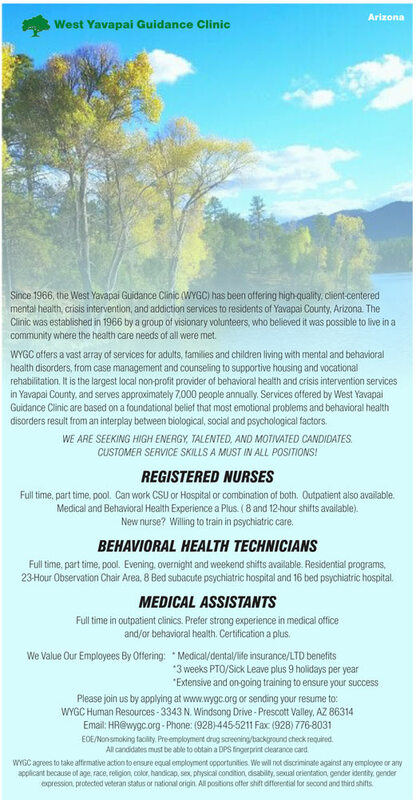 Since 1966, the West Yavapai Guidance Clinic (WYGC) has been offering high-quality, client-centered mental health, crisis intervention, and addiction services to residents of Yavapai County, Arizona. The Clinic was established in 1966 by a group of visionary volunteers, who believed it was possible to live in a community where the health care needs of all were met. disorders result from an interplay between biological, social and psychological factors. WE ARE SEEKING HIGH ENERGY, TALENTED, AND MOTIVATED CANDIDATES. CUSTOMER SERVICE SKILLS A MUST IN ALL POSITIONS! Full time, part time, pool. Can work CSU or Hospital or combination of both. Outpatient also available. Medical and Behavioral Health Experience a Plus. ( 8 and 12-hour shifts available). New nurse? Willing to train in psychiatric care. 23-Hour Observation Chair Area, 8 Bed subacute psychiatric hospital and 16 bed psychiatric hospital. and/or behavioral health. Certification a plus. EOE/Non-smoking facility. Pre-employment drug screening/background check required. All candidates must be able to obtain a DPS fingerprint clearance card. expression, protected veteran status or national origin. All positions offer shift differential for second and third shifts.